The Ocean Cleanup system deployed in the Great Pacific Garbage Patch to sweep up plastic trash at the ocean's surface. SAN FRANCISCO – The people behind a Dutch nonprofit focused on cleaning plastic pollution from the world's oceans are nothing if not resilient. Two months after the launch of their massive trash-collecting device to the middle of the Pacific Ocean, they're revamping the design they've worked on for years after it turned out to have some problems. "The journey toward a clean ocean is certainly not an easy one," said the Ocean Cleanup's Chief Operations Officer Lonneke Holierhoek from her office in Rotterdam. 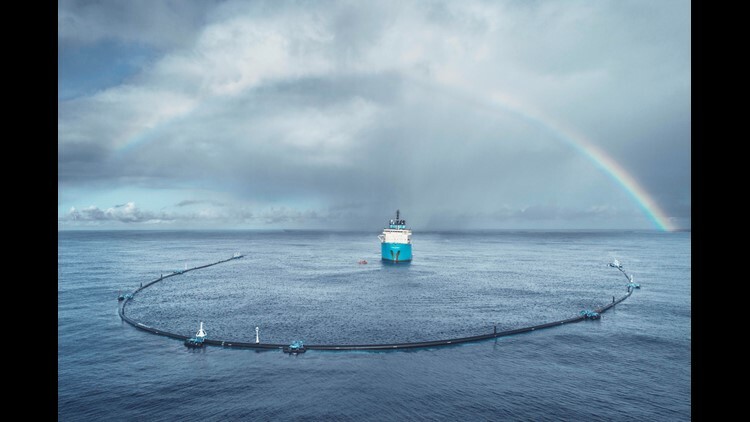 In a post on its blog late last month, the Ocean Cleanup's CEO Boyan Slat wrote that the device deployed in the Great Pacific Garbage Patch to much fanfare in October was having trouble holding on to the plastic pollution it was created to corral. To help fix the problem, the primary vessel that oversees the project is expected to arrive in San Francisco Friday or Saturday to take on a new crew and resupply, including special equipment to help modify the device, dubbed System 001. "Depending on when all our gear arrives, it will probably depart on Tuesday," said Holierhoek. Millions of tons of small and large pieces of plastic are constantly being washed into the world's oceans, where they tend to collect in specific areas determined by currents and weather. These slow-moving whirlpools create vast areas of water infested with plastic pollution that hangs in the water like fog, harming marine life and leaching chemicals into the sea. More: Where did the trash in the Great Pacific Garbage Patch come from? How do we stop it? 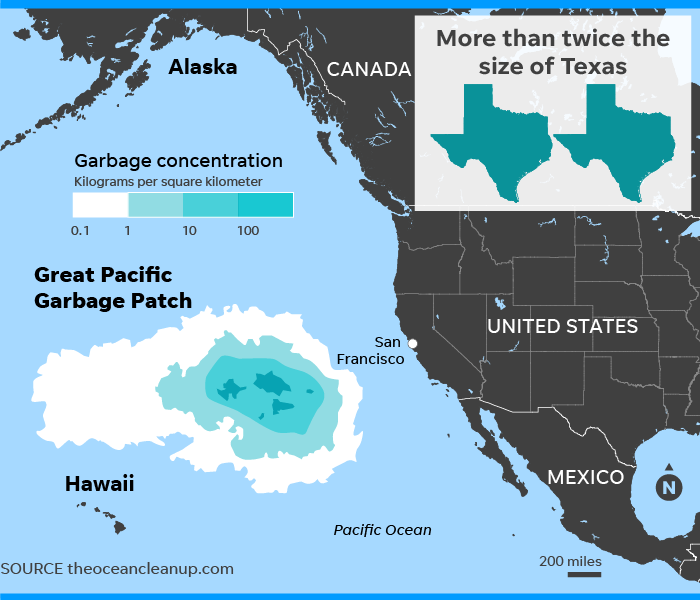 The passive system created by The Ocean Cleanup involves a floating series of connected 4-foot booms that form a giant horseshoe at the surface of the ocean. It was meant to corral the plastic garbage via a 9-foot skirt that hangs down in the water below the boom. The action of the currents and waves was expected to push trash into the system’s center while the tiny pieces of floating plastic were captured by the hanging barrier. The web post from Slat said the system was only retaining the floating plastic pollution it's meant to pick up "for a relatively short time." 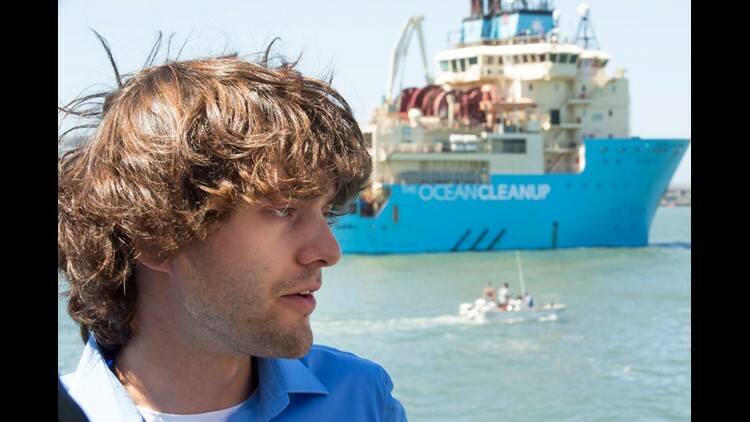 Boyan Slat, is a Dutch college dropout, so disgusted by plastic waste he has devoted his life to cleaning up the mess. The device was towed out under the Golden Gate Bridge on Sept. 8, on its way to its destination. After two and a half weeks of testing about 800 miles off the coast, it was towed to its final spot in the midst of the Great Pacific Garbage Patch halfway between California and Hawaii. There, the cleanup hasn't exactly gone as planned. The idea was that the device, which the non-profit calls System 001, would be pushed along by the wind and the waves slightly faster than the floating plastic. That way the trash would concentrate in the middle of the device where it could later be scooped up and taken to shore for recycling. Unfortunately, the system is moving too slowly at times to keep the plastic inside the U-shaped device, allowing it to float out again. Sometimes the plastic even moves faster than System 001, effectively outrunning it. The group's engineers and scientists have been studying the problem since it first became evident and have tried various fixes via computer models. But as they expected from the beginning, there's no replacement for on-the-ground (or in this case in-the-water) experience. "During the process of the design and the engineering there were a lot of points were we said 'Is this assumption we’re making correct? Can we test it? How can we verify it?' We probably ended up with about 50 assumptions that we decided we couldn’t verify anywhere but in the field," said Holierhoek. The Ocean Cleanup team isn't exactly sure why things aren't working that way, though they have a few theories. One is that the force of the wind against the system might be making both extreme ends of the floating pipe oscillate back and forth like a fish's fin. That motion could counteract the force of the wind and slow the system down. "It is also possible that the vibrations in the ends of the U-shape could be creating a type of ripple-force field that repels the plastic away from as it nears the mouth of the system," said Slat on the website. While the main ship is in port and then working its way back to the Garbage Patch, a small crew of six is staying with System 001 in a guard ship. Video cameras and other telemetry instruments on the device itself make it possible for much of the monitoring to be done from Holland, Holierhoek said. System 001 is meant to be the first of as many as 60 such devices the group hopes to deploy to clean the world's oceans of plastic debris. In his post, Slat said it "must work before we can look to scaling up, so there is no time to waste."